Over the past decades, peptide as a therapeutic candidate has received increasing attention in drug discovery, especially for antimicrobial peptides (AMPs), anticancer peptides (ACPs) and antiinflammatory peptides (AIPs). It is considered that the peptides can regulate various complex diseases which are previously untouchable. In recent years, the critical problem of antimicrobial resistance drives the pharmaceutical industry to look for new therapeutic agents. Compared to organic small drugs, peptide- based therapy exhibits high specificity and minimal toxicity. Thus, peptides are widely recruited in the design and discovery of new potent drugs. Currently, large-scale screening of peptide activity with traditional approaches is costly, time-consuming and labor-intensive. Hence, in silico methods, mainly machine learning approaches, for their accuracy and effectiveness, have been introduced to predict the peptide activity. In this review, we document the recent progress in machine learning-based prediction of peptides which will be of great benefit to the discovery of potential active AMPs, ACPs and AIPs. Keywords: Antimicrobial peptides (AMPs), Anticancer peptides (ACPs), Anti-inflammatory peptides (AIPs), Machine learning, Activity prediction, R&D. Keywords:Antimicrobial peptides (AMPs), Anticancer peptides (ACPs), Anti-inflammatory peptides (AIPs), Machine learning, Activity prediction, R&D. Abstract:Over the past decades, peptide as a therapeutic candidate has received increasing attention in drug discovery, especially for antimicrobial peptides (AMPs), anticancer peptides (ACPs) and antiinflammatory peptides (AIPs). It is considered that the peptides can regulate various complex diseases which are previously untouchable. In recent years, the critical problem of antimicrobial resistance drives the pharmaceutical industry to look for new therapeutic agents. Compared to organic small drugs, peptide- based therapy exhibits high specificity and minimal toxicity. Thus, peptides are widely recruited in the design and discovery of new potent drugs. Currently, large-scale screening of peptide activity with traditional approaches is costly, time-consuming and labor-intensive. 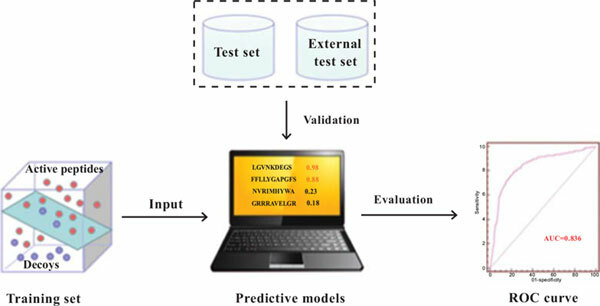 Hence, in silico methods, mainly machine learning approaches, for their accuracy and effectiveness, have been introduced to predict the peptide activity. In this review, we document the recent progress in machine learning-based prediction of peptides which will be of great benefit to the discovery of potential active AMPs, ACPs and AIPs.